Current LCA families have priority enrollment until March 1. The enrollment/re-enrollment process is not considered complete without a payment plan set-up through FACTS. Tuition payments will be processed through the FACTS Tuition Management system, allowing each family access to their account at all times. All families are required to enroll in FACTS Tuition Management and a payment plan is the only way to secure your child’s enrollment at LCA for the upcoming school year. 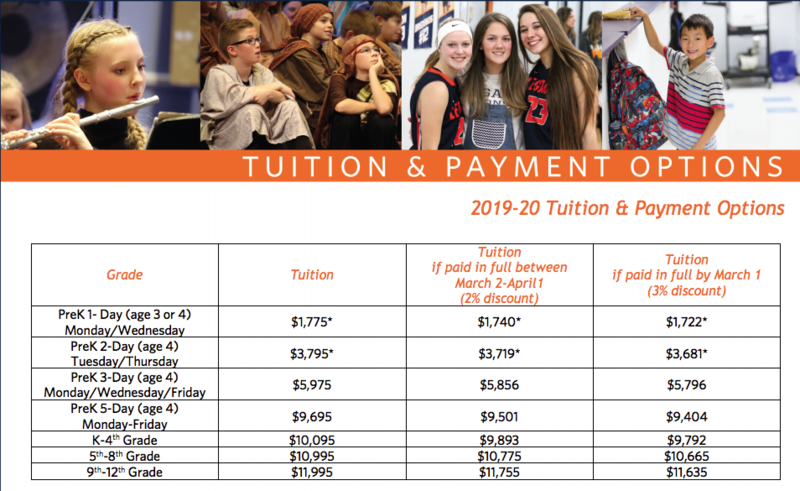 Additional fees may be incurred throughout the school year depending upon the student’s involvement in specific classes, sports, or other activities. Applies only to students transferring out of LCA and choosing to maintain eligibility at LCA for 1 calendar year per MSHSL bylaws. *There is an additional fee for Hockey and Golf. Families applying for tuition assistance must complete an online application form and submit necessary supporting documentation to FACTS Grant & Aid Assessment. The initial deadline for completed tuition assistance applications is May 1 of each year. Thereafter, assistance requests will be prioritized by the date received. Tuition assistance applications that are received after May 1 may result in a lower amount granted due to the tuition assistance available. The tuition assistance application process requires completion of your federal taxes from the prior year. New families are asked to submit tuition assistance applications within 15 days of acceptance to LCA. The PreK 1/2 Day (age 3) and 2-day programs do NOT qualify for tuition assistance. A multi-child scholarship will be applied to all families NOT accepting tuition assistance. Not available if accepting tuition assistance. Prorated discount for students enrolled in PreK 1/2-day, 2-day, and 3-day. Under current legislation, parents may claim a credit and/or deduction on their Minnesota State Income Tax return for some K-12 education expenses. The amount of the credit/deduction depends upon family income. The Legacy PreK program is a Minnesota licensed daycare provider. Tuition paid for PreK may qualify as a deduction on your federal and/or state tax return. Please contact a tax professional for further information. The Legacy PreK program has also been approved to receive payments through the Anoka County Child Care Assistance program.